Looking for a cabin in a great location with all the comforts of home? Check out "Wolves Den!" 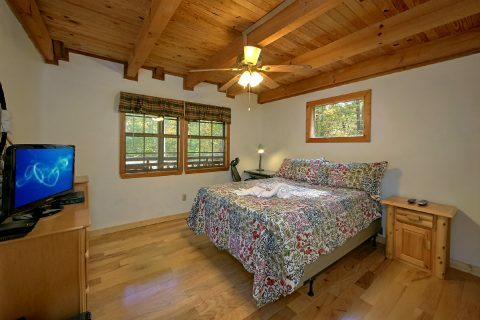 This comfortable, 3-bedroom cabin rests in the excellent Mountain Park Resort area. 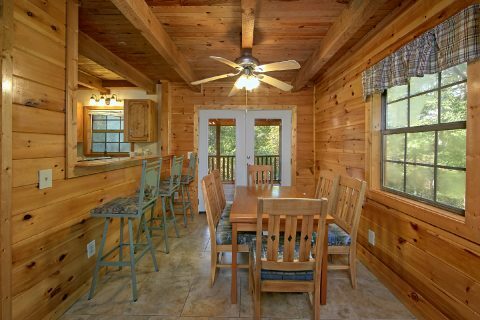 This premium cabin community rests only a mile from the heart of Downtown Pigeon Forge, so guests will waste no time finding great attractions along the Parkway! With access to top destinations like the Island, the Old Mill, and Dollywood Theme Park, your family is guaranteed to have an excellent time exploring the Smokies! 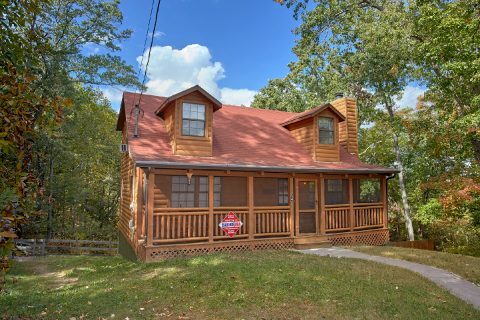 Better yet, you can look forward to retiring to your cozy cabin with plenty of room for your friends or family! 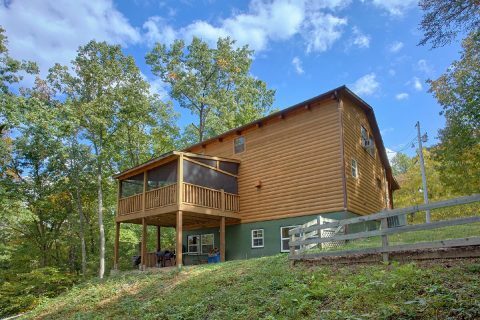 This cabin rental also provides resort swimming pool access at the Mountain Park Resort area, so guests can enjoy outdoor swimming during the warm summer months. 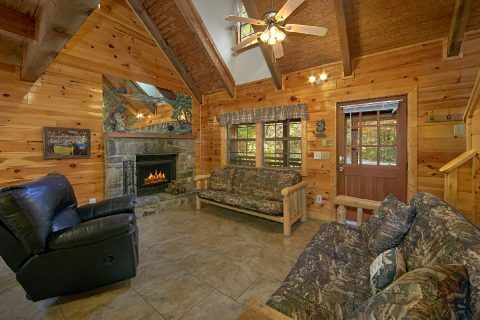 Enter into the main living area and you'll find a comfortable space complete with 2 stylish, log sofas, a leather recliner, and a wood burning fireplace, the perfect place for spending time with great company. 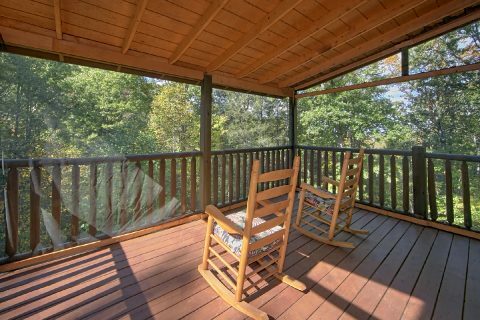 This cabin's front porch is screened-in, so you can enjoy sitting back in porch rockers without being troubled by insects. On the main level, there's also the full kitchen, dining area with 6 chairs, and a bar with 3 stools. 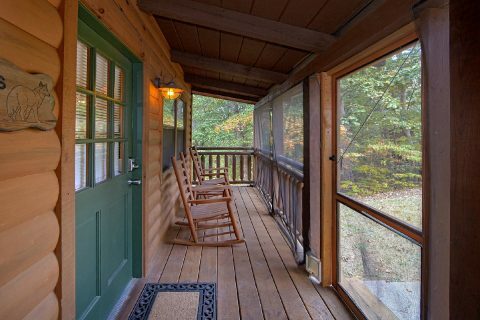 From here, you can step outside onto your cabin's back porch with more rocking chairs to enjoy some time in the great outdoors. 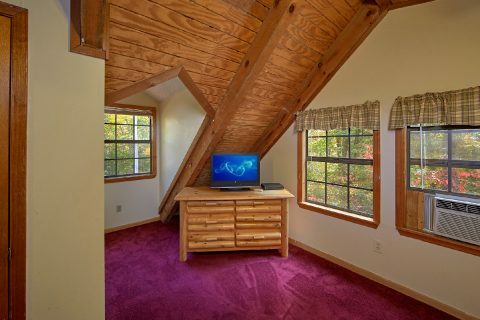 The main floor is also home to a queen-size bedroom complete with a television. 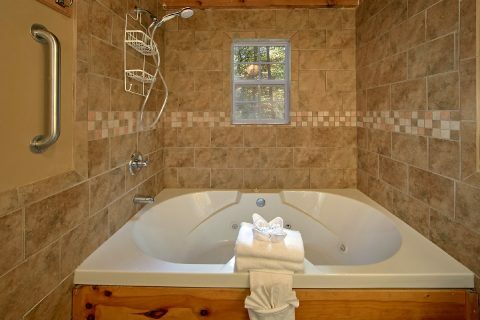 A bathroom on the main level offers a jacuzzi tub for relaxing in privacy. Upstairs, there are two king-size bedrooms with televisions. 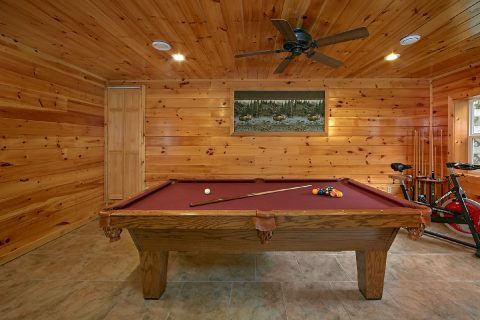 On the lower level, you'll find a game room with a pool table, for enjoying some friendly competition during your stay. This room also comes complete with an exercise bike for staying in shape on your trip. 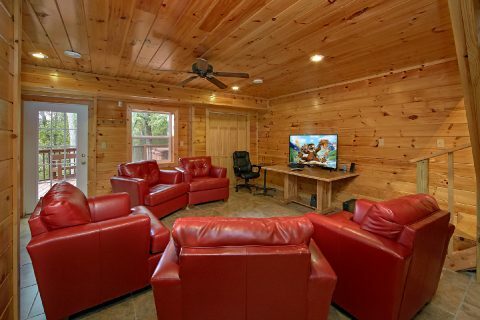 The game room also features a 55" flat-screen television, surround sound, a BluRay DVD player, 5 leather chairs, and a log futon for watching great movies on your vacation. 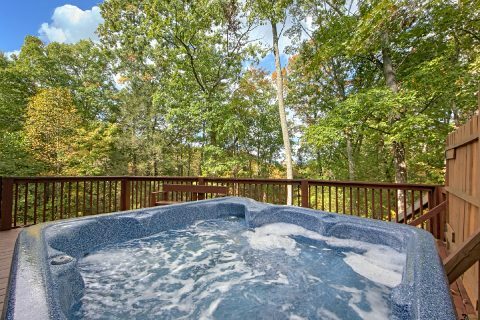 From this level, you can step outside to a deck with a 6-person hot tub, charcoal grill, and access to a fenced-in back yard – a great place for children to play while you unwind in the hot tub. 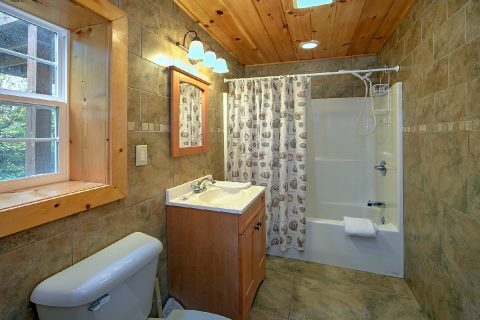 Your cabin boasts all the practical conveniences you need to make your trip a success. 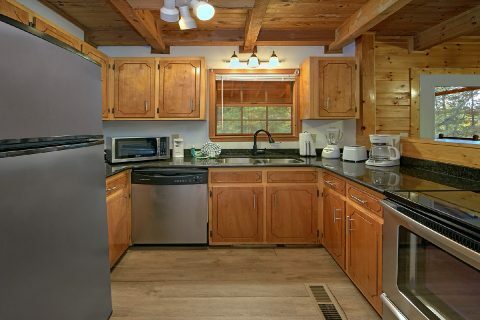 The cabin's kitchen gives you the option of preparing tasty, cost-effective meals without having to leave your rental. 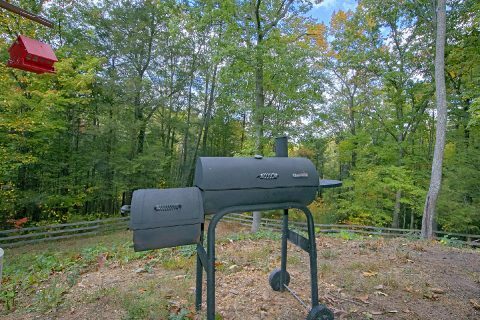 Additionally, this cabin provides a charcoal grill for hosting cookouts. Wireless Internet is also provided in your cabin, so you can always stay in touch with the outside world and research new things to do on your vacation! 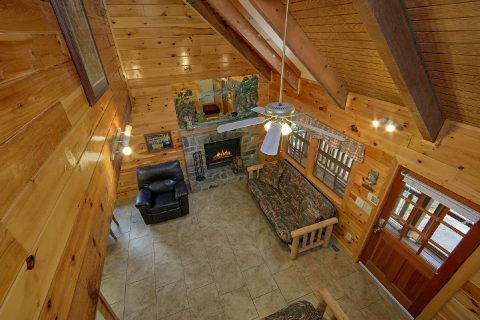 Altogether, this cabin in Mountain Park Resort sleeps up to 10 guests in comfort with 2 king-size bedrooms, 1 queen size bedroom, a futon in the game room, and a sleeper sofa in the living room. 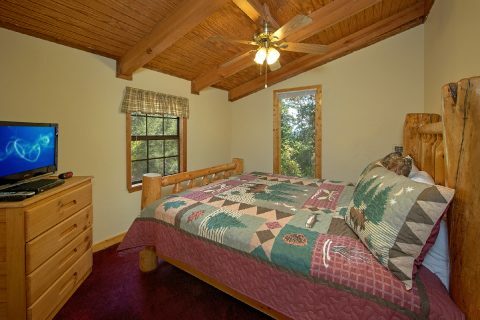 Start planning an excellent getaway to Pigeon Forge and the Smoky Mountains by booking your cabin online today! 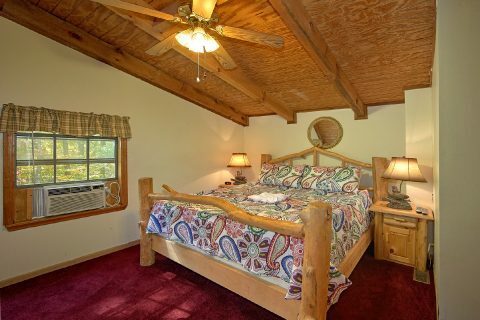 Cabins USA offers this cabin with a special discount, so simply check this cabin's availability to see how much you can save on your nightly rate!